The p2, the supportive media, is the least important part of a presentation. It will not destroy a great story p1 or sink an excellent delivery p3. However good it can never resurrect a poor story or save a terrible delivery. Some presentations survive a technical failure of p2, some are made better by delivery unsupported intentionally. p2 is the least important part of any presentation. Sadly, the majority of presentations delivered are based almost totally on p2. 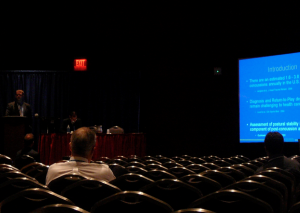 Many conferences exemplify this showing the slides as of more value than the presenter. The presenter believes that the slideument will carry the day and so puts all the effort into its construction. This is simply wrong. A presentation based on p2 is rigid. It often becomes a script that the audience will tire of within seconds, initially of the recitation and secondarily of reading themselves. This is a document, better enjoyed from an armchair, not a conference hall. The p2 should be supportive of the message, not be the message itself. Even a very poor p2 cannot sink a great message delivered with style. A slidedeck that jars with the audience for whatever reason be it complex, poorly designed or even poorly projected can effectively be ignored if the presenter captivates their audience. Some presenters face a significant challenge if the media fails as their delivery is anchored in the structure of p2. This can be countered by practise and preparation. The result often though is a perceived increase in the p cubed value as the presenter is forced to deepen their engagement with the audience. Unlike p1 or p3, a poor p2 will never sink a presentation. Perhaps the strongest evidence for the low value of p2 in a presentation is where a presenter choses intentionally to deliver their message without the support of media. This is an added challenge for the presenter but it changes the dynamic of the presentation. It forces the audience to concentrate solely on the presenter, minimises distraction from the message and is hugely powerful. When constructing a presentation consider what additional value a p2 will bring. It is not compulsory. The p2 brings the least value to a presentation. It should only be considered after the p1 is well constructed and probably after delivery has been practised once or twice. In the maths of preparation it should be the section that takes the least amount of time and probably is best done last. Structure defined by supportive media can be harder to edit. Build a message that will change the audience p1, practise its delivery p3 and then look to illustrate and support that with p2. The p2 is the least important part of a presentation.